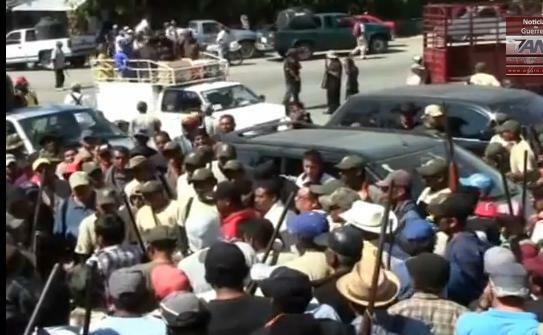 A group of 1,500 Mexican vigilantes arrested the Tierra Colorado police chief this week and took over the town. The vigilante group said the chief was working with local drug gangs. Hundreds of armed vigilantes have taken control of a town on a major highway in the Pacific coast state of Guerrero, arresting local police officers and searching homes after a vigilante leader was killed. Several opened fire on a car of Mexican tourists headed to the beach for Easter week. Members of the area’s self-described “community police” say more than 1,500 members of the force were stopping traffic Wednesday at improvised checkpoints in the town of Tierra Colorado, which sits on the highway connecting Mexico City to Acapulco. They arrested 12 police and the former director of public security in the town after a leader of the state’s vigilante movement was slain on Monday. A tourist heading to the beach with relatives was slightly wounded Tuesday after they refused to stop at a roadblock and vigilantes fired shots at their car, officials said. The vigilantes accuse the ex-security director of participating in the killing of vigilante leader Guadalupe Quinones Carbajal, 28, on behalf of local organized crime groups and dumping his body in a nearby town on Monday. They reported seizing several high-powered rifles from his car, and vigilantes were seen toting a number of sophisticated assault rifles on Wednesday, although it was not clear if all had been taken from the ex-security director’s car. “We have besieged the municipality, because here criminals operate with impunity in broad daylight, in view of municipal authorities. We have detained the director of public security because he is involved with criminals and he knows who killed our commander,” said Bruno Placido Valerio, a spokesman for the vigilante group. Here’s video of the vigilantes.